ROCKSTAR ENERGY MAYHEM FESTIVAL 2014 OFFICIAL LINE-UP ANNOUNCED! The world’s biggest heavy music touring festival, the ROCKSTAR ENERGY DRINK MAYHEM FESTIVAL in its seventh annual sojourn, is pleased to announce the official 2014 artist line-up with the boldest, largest, loudest and most diverse lineup to date! Not only will this year’s festival include the massive ROCKSTAR ENERGY DRINK MAIN STAGE and COLDCOCK AMERICAN HERBAL FLAVORED WHISKEY STAGE, but will also present two additional stages— the SUMERIAN RECORDS/HEADBANG FOR THE HIGHWAY STAGE, and the VICTORY RECORDS STAGE. The ROCKSTAR ENERGY DRINK MAIN STAGE will boast a collection of some of the biggest bands in heavy music—including multi-platinum headliners Avenged Sevenfold, as well as Korn, Asking Alexandria and Trivium. The COLDCOCK AMERICAN HERBAL FLAVORED WHISKEY STAGE will feature headliner Cannibal Corpse as well as Suicide Silence (featuring new singer Eddie Hermida), Miss May I, Mushroomhead, Texas Hippie Coalition and King 810. THE SUMERIAN RECORDS/HEADBANG FOR THE HIGHWAY STAGE will feature headliner Body Count featuring Ice-T as well as Upon A Burning Body, Veil of Maya, Darkest Hour and the local Headbang For The Highway winner. The VICTORY RECORDS STAGE will feature headliner and Revolver Magazine cover band Emmure as well as Ill Nino, Wretched, Islander, and Erimha. This year’s odyssey will include four stages of heavy music and 20 bands. Also, look for Freestyle Motocross legend Jimmy Fitzpatrick and his FITZ ARMY of riders and a Motorsports exhibition area featuring Unknown Industries Harley Davidson Freestyle Riders, as well as many other surprises and attractions throughout the festival midway. The festival will kick off on July 5th at San Manuel Amphitheatre in San Bernardino, CA and will hit a total of 26 cities, ending at The Woodlands, TX (Houston) at the Cynthia Woods Mitchell Pavilion on August 10th. * Lineups in each city may vary. 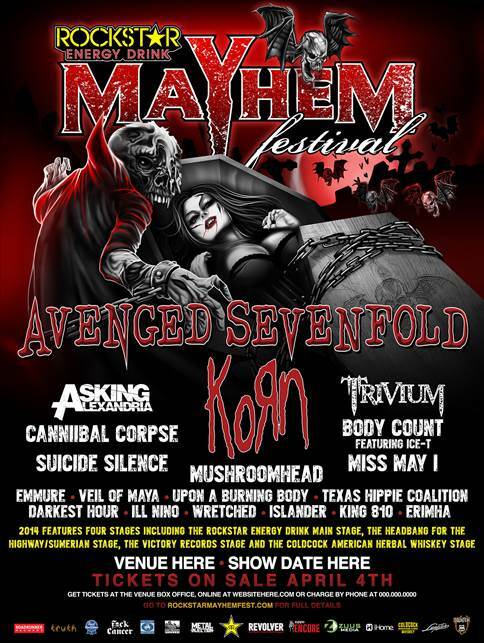 Go to http://www.rockstarmayhemfest.com for full lineup details. 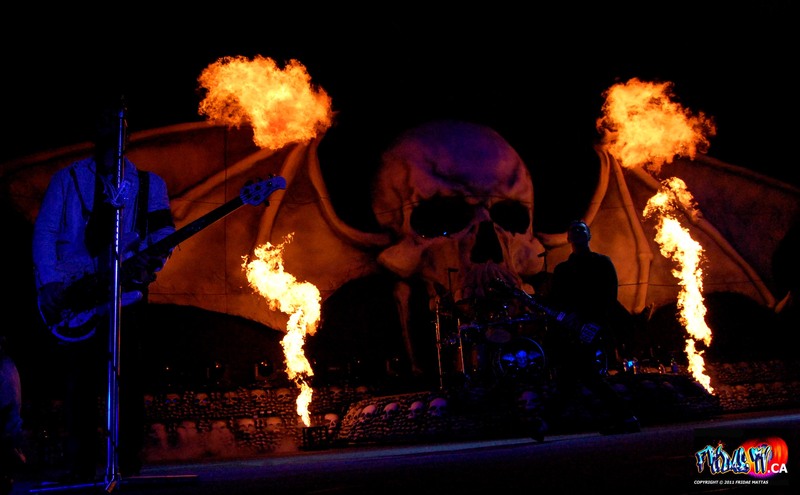 Avenged Sevenfold achieved worldwide success with a string of best-selling albums — including two consecutive No 1’s on Billboard’s Top 200 Albums chart, Nightmare (2010) and their latest Hail To The King (2013) — achieving Diamond, Platinum and Gold awards for album sales in nearly a dozen countries. The band, which hails from Huntington Beach, CA, have become known for their spectacular live shows, routinely selling out arenas worldwide and headlining some of the biggest and most prestigious music festivals. This summer they are scheduled to perform five shows at the Soundwave Festival in Australia, as well as Rock Im Park and Rock Am Ring in Germany, the PinkPop Festival in Holland, Donington Park in the U.K., and two nights at Summersonic in Japan, along with several others. In November 2012, they made an unprecedented appearance as characters in Call of Duty Black Ops 2 — the biggest-selling video game of all time, which featured the band’s performance of “Carry On,” written specifically for the game. The Rockstar Energy Drink Mayhem Festival is the World’s Premier Heavy Music Touring Festival. The Festival is entering its seventh year in 2014 and has performed more than 160 Shows throughout North America to over 1.7 Million fans. The festival was founded by John Reese and Kevin Lyman and is booked by Darryl Eaton at Creative Artists Agency. Rockstar Energy Drink is the title sponsor and has maintained that role since the festival’s inception.